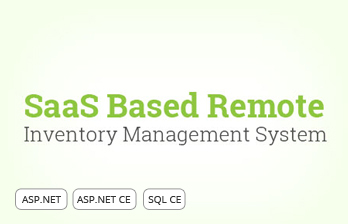 Client is a California based Softwareas-a-Service (SaaS) provider for remote stock room inventory management solutions. Client was founded in 1994, has hundreds of satisfied customers in industries where it is critical to have good remote inventory management at the last step of the supply chain: the point-of-use (POU). Client provides organizations with real-time visibility into remote storeroom inventories and then automates replenishment. Whether the inventory is consigned or customer owned, client manages inventory at the point-of-use to increase sales and service levels, optimize inventory and eliminate stockouts. While items at the POU may be inexpensive or commodity products, the cost of a production line shutting down from a stock out or an inoperable machine is prohibitive. Client’s service productively and cost effectively optimizes inventory while maximizing service levels at the remote stockroom, store, or service van. No matter what their client’s approach is to inventory ownership, inventory location or inventory replenishment, they can accommodate their Client’s method and automate the process of tracking and replenishing their client’s inventory at the POU. Industries that can benefit most from their service include: manufacturers; suppliers and wholesale distributors (electrical, electronic, fasteners, wire, industrial, MRO/spare parts, etc); food service; and fleet maintenance. 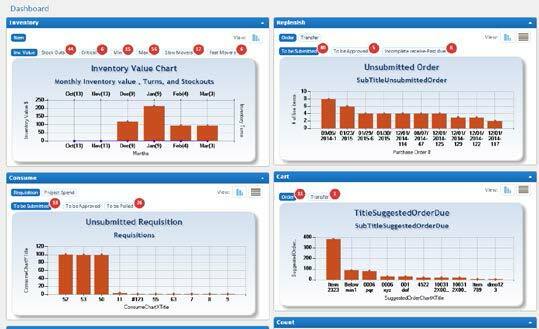 Total control with Super Administrator who can manage each and every function across all enterprises,companies, and stockrooms. Considering client’ s requirement Silver Touch proposed and developed stock room management inventor y system in ASP.NET (W eb Application) and Windows 6/6.5 (PDA (POU) Application) with Agile Methodology. 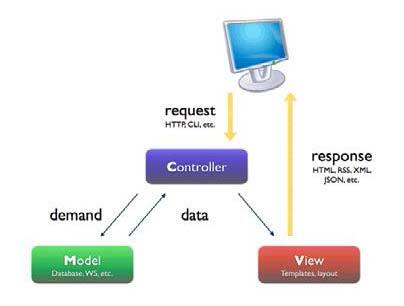 Web Application was developed with MVC 4 which has many advantages that helps to develop great applications. PDA devices were suggested by the client who was having scann ing facility which was used to develop barcode scanning functionality for quick and easy stock management. Unique offline functionalities were developed for PDA so user can use PDA Application where inter net connectivity is not available, so data can be stored locally on the device and whenever internet connectivity is available these data can be synchronized with the central database. This is a SaaS based Remote Stockroom Inventor y Management System where their client’ s customers can manage multiple endcustomers’inventory. Their client can create as many enterprises as they wish and ea ch of them can have as many companies under them and then as ma ny Stockrooms under that. End Client also has their own account from which they can man age their own inventor y and generate reports. Items can be stored at single or multiple locations and they are also tracked through this application. Critical, Minimum, and Maximum Levels can be managed at item or location level an d if on hand quantity of any item goes below its minimum level then application automatically adds that item into the cart for procurement process. A completely customized reporting capability was developed for Reports. 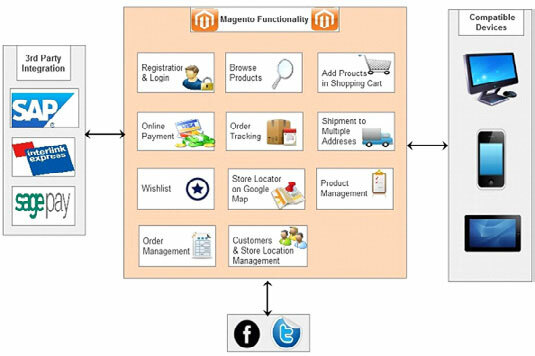 Category, Supplier, Manufacturer and Cost filter and search functionality is avail able for items. Client can create and manage enterprises. They can also create companies, rooms, and locations for the enterprise(s) as per requirement. It allows users to view inventory items and their attributes. Allow users to setup cycle counts, perform cycle and manual counts. Administrator can create maintenance alerts for tool maintenance. Alerts can be set as daily, weekly or monthly tool maintenance reminders. 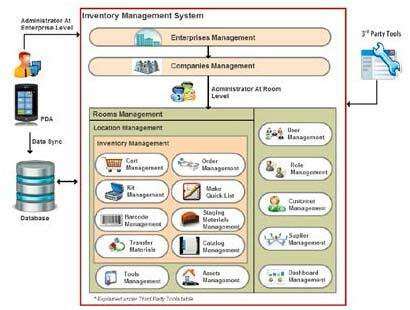 Enterprises can setup their customers using this module to track where material is consumed. They can import an item, item location quick list, assets, and tools. 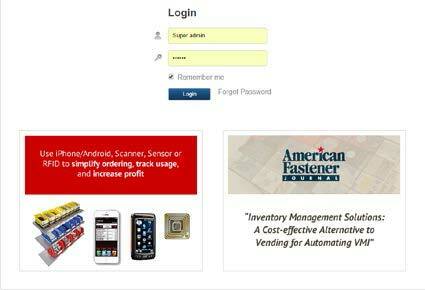 Pull module allows users to track consumption of inventory. Users can select item, bin location, quantity and add specific information for each transaction. Pull All functionality allows user to pull multiple items with one click. After placing the order, supplier will receive an email for that order. Alternatively, orders can be sent via EDI, xml, or flat file to the suppliers. 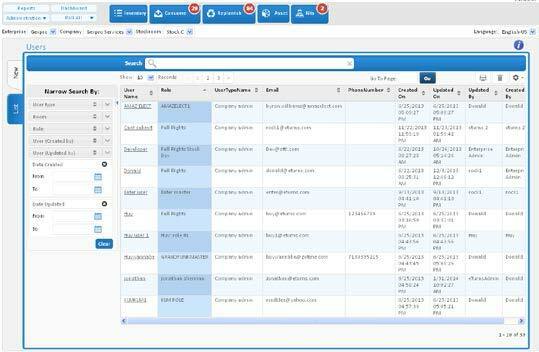 Allows the users to format and print inventory catalogs with barcodes. Barcode labels can include the Enterprise logo and an image of the item. Users will be able to determine which barcodes are associated to items and assets and tools. Allows users to view turns, stock outs, recommended min/max levels, slow moving items and fast moving items. User can Pull All of the material at one time in a single click. Unused material can be moved back into general inventory. Allows the users to replenish inventory by submitting a list of items and quantities to another replenishing room. This module is usually used to manage material between a warehouse and contractor service trucks. Customized barcode with PDF format can be generated dynamically for items, tools, assets, orders, and receipts. Users can get email for tools and asset maintenance, sending orders and receiving etc. To keep staging materials for special projects. NPOI To read xls file and generate XLS file by Code. Email template management Language wise and room wise with FCK editor and fetching of same customized text on triggering the mail. 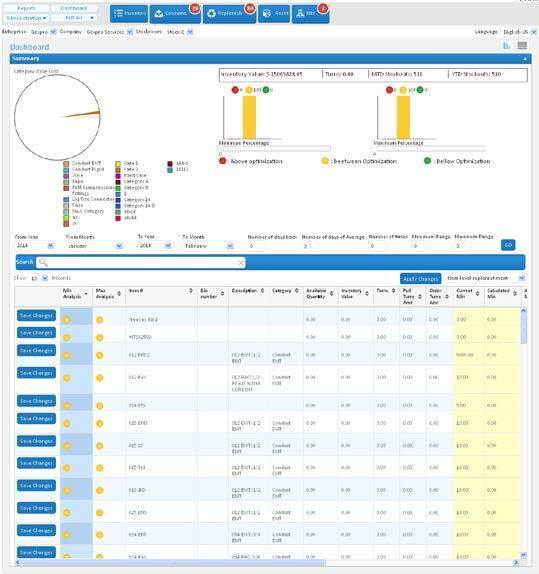 Dashboard with high level overview of inventory stock and Inventory tuning. Client is now selling this SaaS based Remote Stockroom Inventory Management System to their clients and getting additional revenue. This application has removed limitations of client’s current client ser ver Application. eVMI Sensor based inventor y counting increased speed and accuracy. Online & Offline management from PDA device. Dynamic Dashboard for all modules and stock status with graphi cal representation of data. Automated Order and transfer creation based on Schedules improv ed perfor mance. Auto update functionality is available to give notification to PDA users to update application.